A couple of weeks ago, when my better half was home for the weekend, I took the opportunity to grab him to the supermarket to stock up on rice, milk powder and bulky items which I would have problem lugging home on my own. While wheeling the trolley around, I spotted a small crowd at the fresh fruits section. I left the trolley to my kids and went up to check out what was the deal...organic grown strawberries were going at one third the original price! That was really a good deal, besides, the strawberries looked very fresh with stems that were still bright green. I grabbed, 3, then 6 punnets and placed them in the trolley. You would think that would be enough, but the greedy me, went back to grab another 3 and a few packs of blueberries too! I used some to made a strawberry galette and a double berry jam, both of which were on the top of my to-do list. I took the homemade jam recipe from this book, 低热量点心DIY...homemade desserts with low calories. 1/10 serving of this strawberry and blueberry jam contains 63kcal, and 0.1g fat. I am not sure whether the figures are true, but I would choose to believe it as the amount of sugar used is less than most jam recipes. As with most of my past jam making experiences...the process of making homemade jam is so easy...much easier than cooking a pot of porridge. As suggested by the recipe, I prepared the ingredients the night before, and left the berries and sugar to sit over night in the fridge. The next morning, when I was ready to cook the jam, much of the juice was 'extract' by the sugar from the fruits. It took me less than 15mins to cook the jam and can it. In the past, I have never liked fruit jams. I am the kaya and butter person. But, ever since I started making my own jam, my opinion about it has totally changed! Wash and remove the stems from strawberries, cut into halves or quarters(for bigger ones), leave whole for small berries. Wash and drain blueberries. Mix strawberries, blueberries and sugar in a bowl. Cover and leave in fridge over night, or let it sit for at least 30mins. Transfer the mixture (including whatever juice that was drawn out from the berries) in the bowl to a stainless steel pot or a large saucepan. (Note: use non-reactive pots made with stainless steel, glass or enamel, avoid pots made with copper, aluminum or cast iron which would react with acid). Drizzle in the lemon juice and cook for a further 2~3 mins. Ladle hot jam into hot sterilised jars, fill to the brim. Secure lids. Let cool. Once opened, store in fridge and best consumed within 1~2 weeks***. Wash glass jars and lids in hot, soapy water, rinse well. Place jars and lids in a pot. Fill with enough cold water to cover the jars. Place over high heat and bring water to the boil. Reduce heat to medium and boil gently for 10 minutes. Remove jars and lids from boiling water and drain upside down over a clean tea towel. Preheat oven to 110 degC. Place jars and lids upside down on a baking tray. Place in the oven and heat for 15 minutes. Proceed to make the jam while the jars are in the oven. Do use glass jars with lids that come with a gum binder that seals them against the top of the jar. ** Do not omit the lemon juice as it help to hold the jam together and enhances the flavour. *** For safe eating practices, do examine the jam frequently for signs of spoilage. Very admire your passion to make your own fruity jam! It's indeed a very good one. I love your fool-proof jam recipes. Mango/passion fruit jam was the best jam I've made. I'll try this one too. Wow! The jam looks luscious! I wanna make my own now! looks very colourful. i had made blueberry juice last week.. may be try blueberry jam next time. thanks for sharing dear. I am also a kaya and butter (peanut butter, haha) person! Since young, I always feel that jams (store bought) are always too sweet and artificial to my liking. Hehe... I never tried homemade jam before. the jam looks great! now i can my breads with this instead of just "roti kosong" hahaha..
Hi! I'm a bit new to making homemade jams. Can you tell me why the jars need to be sterilized? What does sterilizing do? Thanks. Hi Joyce, you need to sterilise the jars so as to kill all the microorganisms that spoil food, then seal the jar tight to keep them out. Homemade jam has got no preservatives so this step is important. I used to make jam so often during summer in California when the fruits are adundant. Now that all those jars are shipped back and sitting in my store room, gives me a good reason to make some soon. Thanks for the lovely jam recipe. Hi Honey boy, I got them from Carrefour, not sure whether they are still having the promotion. Haha! 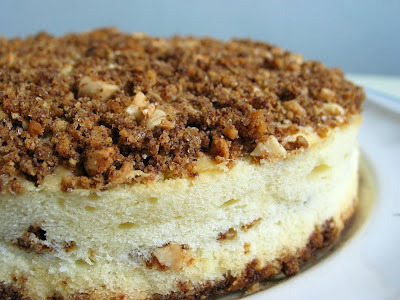 I'm a kaya-and-butter person too, you aren't alone! actually I made kaya yesterday,not a success recipe but taste ok. use fresh fruits to do jam, in fact it is very good, fresh and yummy. Hi! When you put the bottle cap in the oven, do you remove the rubber binding? Can share where you usually get your jam bottle? Thinking of making some for a close gf who recently lost her mom. 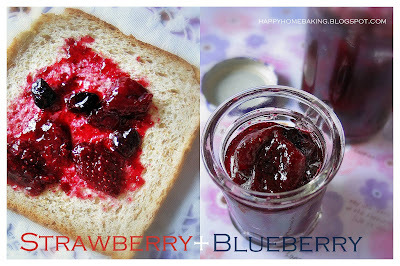 HHB, i love the combination of berries used in your jam. Looks berrilicious! Thanks for sharing! It's berry season and everything is half price! Would love to try making my own jam soon! I have never made jam, as I am a kaya person too. I just made kaya. check out my post. But the way you describe how easy it is I should try, furthermore I am in USA now so fresh fruits are amazing!! Hi, may I know that in step 2, when you mix strawberries, blueberries and sugar in a bowl, do you add water? Hi Jia Ying, no water is added, just eh berries and the sugar. thanks for the detailed steps on sterilising the bottles. i have been wanting to make jams but can't find detailed instructions on sterilising. yours are great! now i can finally start my jam making. thanks again! MH, yes you can use frozen blueberries. You just need to rinse and thaw the frozen berries and proceed as per step 2.
since u like to make jam, just to let u know that apricots are in season now. I bought fresh apricots (Aksun brand 350g for $3.50 at NTUC). Offer ends tmr unless it is extended. i chose the slightly under ripe for making jam (cos more pectin) n those ripe with a tinge of red kept to eat fresh. Hello ! Can I ask where you buy the jam jars from? Hi, I didnt buy the jam jars those are used jam jars. hi, i've made the jam last nite! it was great taste! thanks! by the way, im using those ikea jars , not with rubber binding. do u think i can leave them outside for a few days or they must be kept in the fridge even they are not opened yet.? Hi Trish, I have not used those ikea jars. For jam jars, after filling with the hot jam, the lid will be tightly sealed. It will give a 'pop' sound when it is opened, thus it is safe to store the jam in room temperature. I would think it is best to store your jam in the fridge just to play safe.